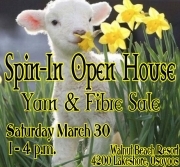 Stop by and visit us at Walnut Beach in Osoyoos this Saturday, March 30 from 1 - 4. Be sure to check back regularly as I w ill be posting events we will be attending as well as hosting throughout the year. 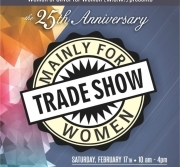 This event has been enjoyed by both men and women in the South Okanagan for 26 years!Come by to checkout the vendors and enjoy lunch which is being offered by Oliver Eats!! 1st Annual "Oliver Christmas Market"
Join us and many other vendors at the Firehall Brewery for their outdoor 1st Annual "Oliver Christmas Market"
Sunday, December 16, 2018 from 1pm - 5pm. Christmas Open House x 2 this Year! 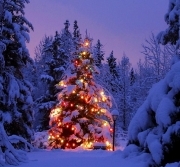 We will be having 2 holiday Open Houses this year. Please stop by for a visit with our animals or do some Christmas shopping in our farm store. If you can't make it either of those days, please give us a call and if we are home we will be Open!! Penticton Trade and Convention Centre. What a fun morning with Nikki Dawn Photography from Osoyoos doing this beautiful wedding shoot with our very own, filthy looking(white?) alpaca Cleo!!! 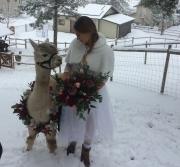 Thanks for choosing Sunkeya Farm Alpacas for this amazing shoot!! Please stop by for a browse through our farm store and some Christmas goodies. 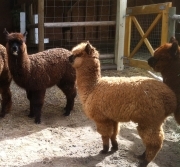 Spring is in the air, the alpacas are patiently awaiting Shearing Day!! Some beautiful fibre on these guys............can't wait! Thank you to everyone who came out for our Christmas Open House on November 20th. For those of you who missed it.......please feel free to give us a call if you would like to come out in the evenings or on the weekends.....because if we are home, we are Open! 2016 Christmas Open House this Sunday! Lots of product for you to choose from! Come join us at our Open House. Bring your camera and your questions. 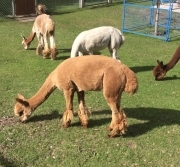 Learn about our alpacas, all they have to offer and what can be done with their luxurious fibre. 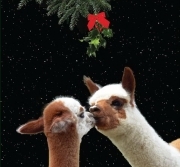 Get an early start on your holiday shopping as you browse through our farm store, stocked with Canadian made products as well as accessories from Peru - home of the alpaca. 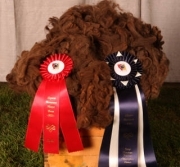 Friday Fleece Show and Saturday Composite Show. 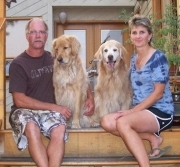 Thank you to Judge Amanda VandenBosch from Bend, Oregon. 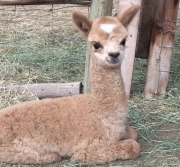 Our one cria for the season arrived on June 12, 2016. Can't help but love that face!! Come out for a visit......give us a call first and if we are home........we are Open! 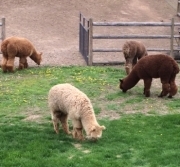 Tintaya and Zamaras enjoying their new digs at Echo Bay with their new friends the Baby Doll Sheep! Come join us for some Christmas Cheer and take a look through our farm store to find that special gift for someone special!! 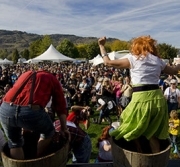 Join us at Wild Goose Winery for a family friendly festival with craft, food and beverage vendors. Stop by for a visit!! â€¢Bratwurst and pulled pork sandwich stand as well as a full menu with ribs, beans and spaetzle available to purchase. â€¢Wine bar provided by Wild Goose Winery and Howling Moon Craft Cider and Bad Tattoo Brewery will be on site. Thank you to everyone who stopped by to see us at our booth at the 2015 Festival of the Grape! We look forward to another great weekend coming up. 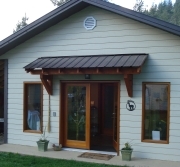 Visit us at Wild Goose Winery. 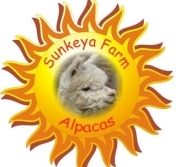 Sunkeya Farm Alpacas has been participating in CAFD since 2010, we continue to look forward to our annual one-day Open House. There is always something for everyoneâ€¦ petting or snuggling a cria, hearing a hum, feeling the luxurious soft fibre and seeing how it can be carded, spun and felted; a stroll through our Farm Store to purchase Canadian made and imported alpaca products, getting a truck load of alpaca beansâ€¦ and, of course, a photo opportunity with the alpacas! We strive to educate people about these amazing animals and all that they have to offer and continue to keep our farm available for visits and shopping year round. 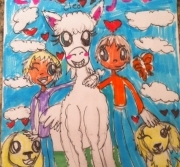 The alpacas have captured our hearts and we have found that they are doing the same to our many returning and new customers. Come see for yourself! Faye and Alidoro soaking up the Sunshine! 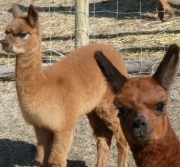 The cria are growing and the visitors are enjoying watching them pronk around in the sunshine. Faye and her brother Ross, visiting from California, took some time out to sit on the lawn and have a visit. 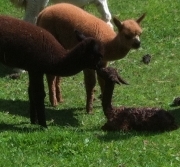 We are happy to say we have 3 happy, healthy cria on the ground! Two boys and one girl, and one more on the way. We will be OPEN on Saturdays and Sundays from 11 - 4 from now until Christmas. If you can't make it during those hours..........just give us a call and if we are home than we are OPEN!! We will be Open on the weekends from now until Christmas. If you can't make it on a weekend, and want to come out in the evening, just give us a call......if we are at home, we are Open!! Bring your camera and your questions. 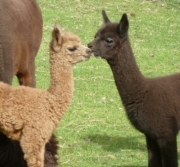 Learn about our alpacas, all they have to offer and what can be done with their luxurious fibre. 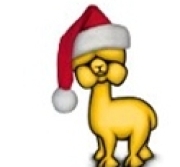 Browse through our farm store and find that special gift, Canadian and Peruvian made alpaca products. 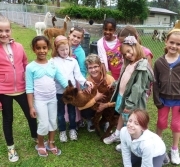 We look forward to sharing our knowledge about alpacas...............be careful...........they will capture your heart! 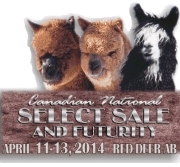 We are off to Red Deer for the 2014 Canadian National Alpaca Sale & Futurity. Always a great weekend. Taking 2 of our 2013 cria with us to show. Sunkeya Tintaya and Sunkeya Caliente. A great big "Thank You" to everyone who joined us for our Christmas Open House on December 1. 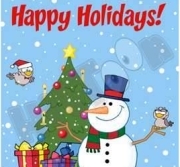 Merry Christmas and All the best to you and yours for a Happy, Healthy 2014. 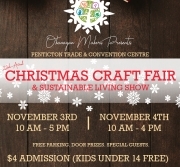 This Christmas Craft Show is the Largest in Penticton & area, has the finest crafts in BC, talented new crafters, with lots of wonderful door prizes! 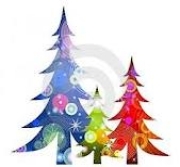 Fabulous gifts galore, music with Simon Funk on his harp, you can buy wonderful holiday decorations and of course SANTA will be there from 1:00 - 3:00 p.m. on Saturday. Get an early start on your holiday shopping as you browse through our farm store, stocked with Canadian made products as well as our new line of KUNA clothing and accessories from Peru - home of the alpaca. 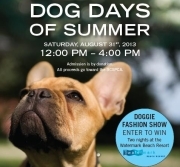 Join us for an afternoon of fun for the whole family, 4-legged members also! Your 4 pawed friends are very welcome! We are very happy with our 2013 crias, which consisted of 2 females and 2 males. Come by for a visit. They are cute and curious! Give us a call to be sure we are here. Our 2013 Cria have arrived! It's that wonderful time of year again when the cria arrive! Our first arrived on May 5th - "It's a Boy!" Tintaya is doing well and first time mom Pearl is a wonderful Mom! #2 arrived a month later on June 5th - "It's a Girl!" Alejandra is a very strong girl and her mom Pandora is fantastic! What to do on a Sunny Easter Weekend? Looking for something to do on this beautiful sunny long weekend? We are here most of the weekend and would be more than happy to have you stop by for a visit! 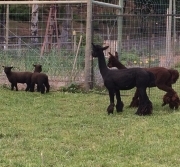 Come see our alpacas with full fleece before shearing! 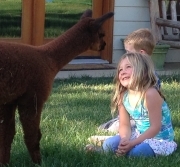 Always fun for the kids to feed the chickens and alpacas, and we love to share our knowledge. 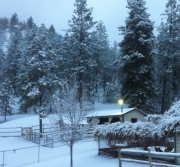 Give us a call to be sure we haven't slipped away to the golf course. Looking for that unique gift for that someone special?? We will be having a Christmas Open House on Sunday, December 9, 2012 from 10:00 am - 4:00 pm. Come join us for some Christmas cheers and browse through our farm store. Evenings - Just give us a call and if we are home, we are OPEN! 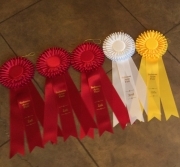 MORE GREAT FLEECE SHOW RESULTS!! 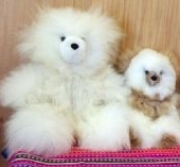 We will be having spinning demonstrations, on hands felting and felting demonstrations through out the day. Events You'll Find us at in September! 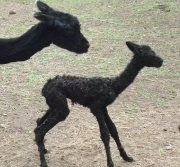 Cria on the Ground - It's a Girl! Welcome......Sunkeya Sabina! She is a beauty and full of energy! First time Mom, BKD's Iza, is amazing! 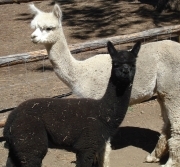 Stop by for a visit......we are always here on Sunday's from 12 noon - 4:00 pm or call ahead any other day or time and if we are here, then we are OPEN and would love to show off our alpacas!! PERU! Our trip of a lifetime! Our trip to Peru was unlike anything we could have imagined......Alpacas, fibre mills, shopping, more alpacas, more shopping and of course Machu Picchu, with a hike to the summit of Huayna Picchu! Breathtaking! Please be sure to stop by and take a look through our shop at some of the amazing items we purchased while in Peru. Happy New Year to all of our friends, family and customers and thank you to all for your support. 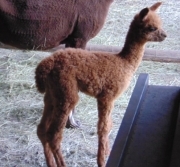 2011 was an exciting year for us with the arrival of our first cria, Alussa, who continues to grow and amazes us with her incredible fleece, confirmation and personality! 2012 brings exciting things to us here at Sunkeya. 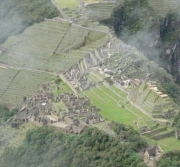 We will start 2012 off with some time to ourselves as we head off to Peru in late February, for what we believe will be a trip of a lifetime. 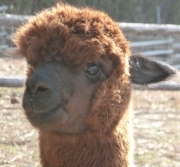 We will be consigning our first alpaca, Pearl, to the 2012 Canadian National Alpaca Sale & Futurity in Red Deer in April. Look for LOT #8. 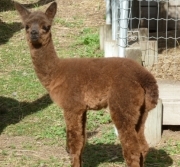 Shearing will happen late April, and then time to look forward to 2 cria this spring. We will be sure to post updates once we are back from Peru! Unfortunately, we will not be open the weekend of December 17, 18th but we will be OPEN on the 20, 21, 22, and 23rd from 4:30 - 8:00pm and then on Saturday the 24th from 10:00 am - 4:00 pm for all your last minute shopping! NEW Children's socks, adult slipper socks. 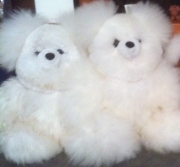 We have lots of soft cuddly teddy bears in stock, they are sure to put a smile on anyone's face......young or old. Our first trip to Lloyminster and a great weekend! 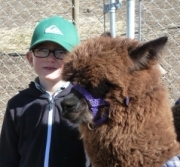 DLH Sunkist Rock - Huacaya Grey - 24 months < 4 years - 1st Place as well as Reserve Champion Grey fleece! Wonderful venue and a great job done by the organizing committee!! Alussa is growing well and fitting in with the rest of the girls. She is now 3 months old and her fibre is looking exceptional with great crimp, density and fineness. 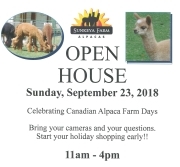 We would like to thank everyone who came out to be a part of our 2nd Annual Open House on the September 24, 25 weekend to celebrate Canadian Farm Alpaca Days. 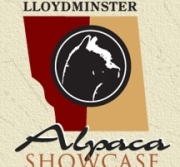 Our farm store will be open on the weekends from 12 - 5 now until Christmas, with the exception of October 2 (come see us at the Festival of the Grape in Oliver) and October 15, 16th as we will be at the Lloydminster Alpaca Showcase. CONGRATULATIONS to Gaby Sage and Trish Osland who both guessed Alussa's weight at 44 lbs. She weighed in on Sunday at 44.1 lbs. Wow! What a day! 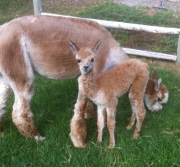 Our first cria arrived at Sunkeya Farm Alpacas at 12:06pm today. She is a beautiful black BB King of the Hill and PSA Royal Velvet daughter. 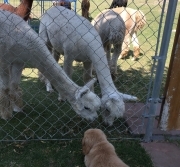 We look forward to many more cria in the future. 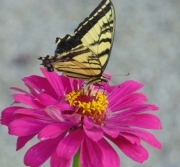 Please feel free to stop by for a look! Welcome to our brand new website. Our new HerdSurfers website allows us to easily have up-to-the-minute accuracy with regards to the staus of our herd. The search functionality on our animals page allows our viewers to select exactly the type of animal they're searching for. Once an animal is found all the necessary information required to "pre-qualify" an animal is logically presented in a simple "one-view" form. All of the animals listed in our On-line herd have the capacity to be presented with 4 generations of pedigree allowing viewers to readily assess lineage quality and value beyond just the dam and sire. 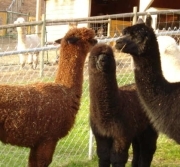 Beyond the standard body shot pictures typically found on most alpaca sites, we can now include head, teeth, rear body shots and more in all of our animal listings, giving viewers greater understanding of the animals at hand. These are only a few of the great new features of our new site. We welcome you to have a look around, take a surf through our herd and feel free to e-mail or call us with your questions or comments. We would like to thank Tyler and staff for their hard work and professionalism during the creation of this site. 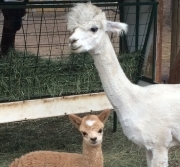 Please stop by and visit our alpacas and our farm store. We are usually open on weekends so just give us a call . Check out our Products section to see a few of the many items we carry. Our Canadian Made products are grown, sheared, processed and knitted in Canada so you can be assured of quality and value. When we are here, we are open!